I woke early after a really uncomfortable night in the tent, which was due to a number of factors. Firstly, the ground we were pitched on, although it had looked fine when we were pitching the tents, when I got into my sleeping bag, I realised there was a slight incline from head to toe as well as from left to right. This meant that not only did I keep sliding to the bottom of the tent but I was also rolling to one side. On top of this, I was cold! My sleeping bag is a lightweight 2/3 season one and had been fine up until now but during the night I had needed to get fully dressed and put my fleece on, just to enable me to sleep. Keld is around 1100ft above sea level and despite this being July, the temperature at this fairly elevated altitude had dipped sharply overnight. This wasn't helped by the campsite being situated in the bottom of a valley alongside a river. Upon returning home after the walk, I found a report on the internet from someone who had stayed in Keld the month before us and had been woken by the cold in the night and upon investigation discovered that his tent was covered in ice. And this was in June! To cap it all, when we emerged from the tents in the morning, there were swarms of midges to contend with. This is the same or very close relative of the Scottish midge and until you have experienced them, you have no idea what they are like. Imagine a cloud of virtually invisible vampires whose only interest is helping themselves to your blood then you start to get the picture. They get in everywhere that there is exposed skin and nothing deters them. There are numerous sprays that claim to protect against them but in my experience, these are of limited use against these demons. They will get in your ears, hair, nose and any available point where there is exposed skin. Alan, whose reaction to these bites was quite severe, hid in his tent until it was time for breakfast. Eventually, after lots of arm waving trying to fend them off, we managed to pack up our gear and head for the barn where our egg and bacon breakfast baguettes were served by the ever helpful Heather. After washing them down with mugs of tea, we collected our packed lunches, paid our bill and after bidding Heather farewell, set off to Keld village from where we would head into the hills. 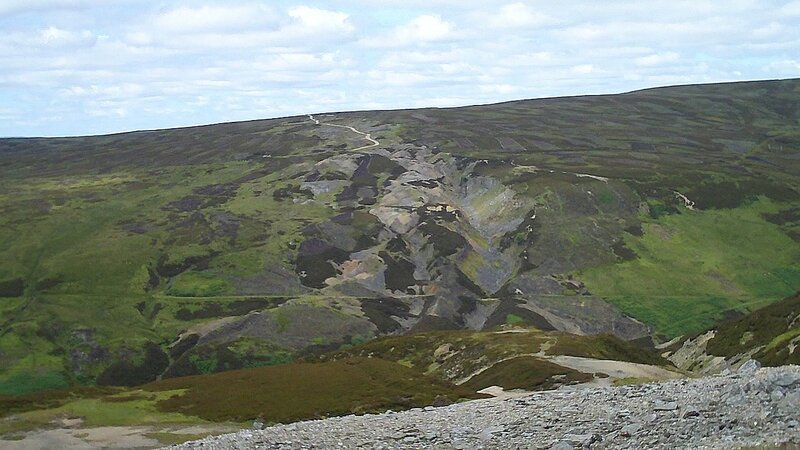 The days route was a high level traverse through the remains of the Swaledale lead mining industry and we would be passing a number of old mines on the walk. As we left the village, we crossed a bridge over the River Swale and admired East Gill Force waterfall at the point where the Coast to Coast walk and the Pennine Way coincide. Passing the forlorn ruins of Crackpot Hall, a ruined farmhouse with a fabulous view down the River Swale, we climbed steeply up the East Gill from the ruins of the Swinnergill Mines, alongside a small stream tumbling down the hillside before joining a wide track across the top of the moors. The next few miles were peppered with the remains of old lead mines and many of the hillsides stripped bare by 'hushes', a man-made process used in mining whereby a dam is built at the top of a hill and water trapped behind it is released before rushing down the hillside and stripping away topsoil to reveal the minerals beneath. 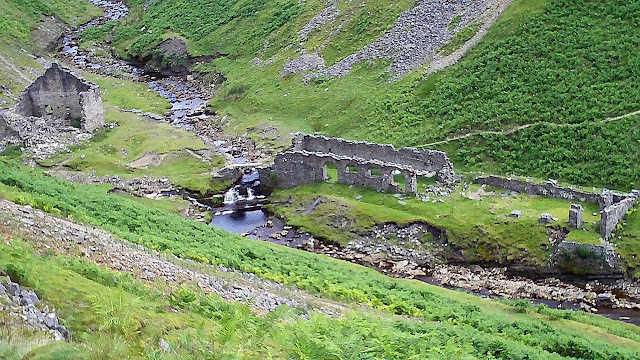 The remaining scene hereabouts was a strange mix of moorland views and industrial remains, as there were many old decaying mine buildings still in evidence. After descending to the ruins of Blakethwaite Smelt Mill, we climbed out of the valley above more mine buildings and reached an area on top of the moors was where the spoil from the mines had been deposited, blanketing the moor in a deep covering of gravel. Here, no vegetation of any sort grows and it felt a little like walking through a quarry, although the access road to the area made for easy walking. From here, we followed a valley alongside a river to the Old Gang Smelt Mill where we stopped for lunch in the sunshine before continuing onto Surrender Bridge, which featured in the television programme 'All Creatures Great and Small'. Contouring around Calver Hill, we reached Reeth, our destination for the day, which is an attractive Dales village arranged around a large village green surrounded by pubs and shops. After locating the Orchard Caravan Park, we met with the owner, Peter who turned out to be just about the most friendly, accommodating person on the whole trip. He obviously had a soft spot for Coast to Coasters as he was charging them £1 less for overnight camping, but more than this, he actually had a number of Coast to Coast caravans specially set aside to save pitching tents and all for the same price! We gratefully accepted Peter's offer of the caravan and were delighted to have the luxury of running water and electricity. Okay, the caravan had seen better days but for £5 each a night, we weren't complaining! He even phoned ahead to Richmond for us to enable us to secure a booking in a guesthouse for the following day. We went through the usual ritual of showering and washing clothes before strolling back to the village for a meal and a few beers. We headed for the Buck Hotel, which had been advertising itself along the route as the meet-up place for Coast to Coasters. It was okay but we found it a little expensive and there was no sign of any Coast to Coasters so we adjourned to the Black Bull, which we preferred. After another beer, we strolled back to the campsite and although, at around 650ft, Reeth is only around half the height above sea level of Keld, it was still quite chilly. The caravans had no bedding so it was a case of using the sleeping bag on top of a double bed and I spent a second uncomfortable night as my sleeping bag struggled to cope with the drop in temperature. Hi Jennifer, Thanks for your comments, glad you are enjoying the blog.